Villahermosa is a historic Spanish Hacienda located near Ruth Hardy Park in the Movie Colony area of Palm Springs. The home was built in 1936, and rumored to be the guest house of a famous celebrity. Our prime neighborhood location is close to town, out of the wind and offers spectacular mountain views. As soon as you walk through the stained glass front door, you feel the warmth and soul of this classic hacienda. The brick, wood burning fireplace in the living room is one of the many beautiful features of the home. Each of the three bedrooms is professionally decorated in it's own unique theme. The kitchen is fully equipped, including stainless steel appliances. Bathrooms are updated, but retain their original character. French doors in every major room lead to the large, private, 36 foot swimming pool and hot tub in the huge, freshly landscaped backyard. Enjoy the fresh citrus from our Grapefruit, Orange, Tangerine, and Lime trees. Dine outdoors with the choice of two different pergolas, or relax in our outdoor gazebo area. The home is complete with Digital Cable TV (2), DSL, WiFi, Gas Barbecue, Fireplace, Stereo with CD/DVD, Jacuzzi Premium Hot Tub, new pool deck area, and poolside speakers. Located in the heart of Palm Springs, less than 3/4 mile to downtown shops, restaurants, galleries, the convention center, and the Spa Casino. The property covers nearly 1/2 acre, and it is beautifully landscaped with flowers, lawn and 5 productive fruit trees. We also offer a private chef and can provide grocery shopping prior to your arrival. Please email us for details. Nearby is world class golf, hiking, botanical gardens, the aerial tram, water theme park, horseback riding, gyms, tennis, and a high-end factory outlet mall. * Also check out nearby Joshua Tree National Monument and the living desert preserve. * Disneyland (Anaheim) and Sea World (San Diego) are less than two hours drive. My husband owns a home automation and lighting company, and I am a real estate agent and interior designer. We live in Redondo Beach, CA and love to come to the desert to unwind and enjoy the fantastic weather! I was staying in a vacation rental in this neighborhood and found this property while I was out for a jog. I love the character of old homes and as soon as I walked up to the old stained glass door, I knew this was a special home. It has a great hacienda feel. 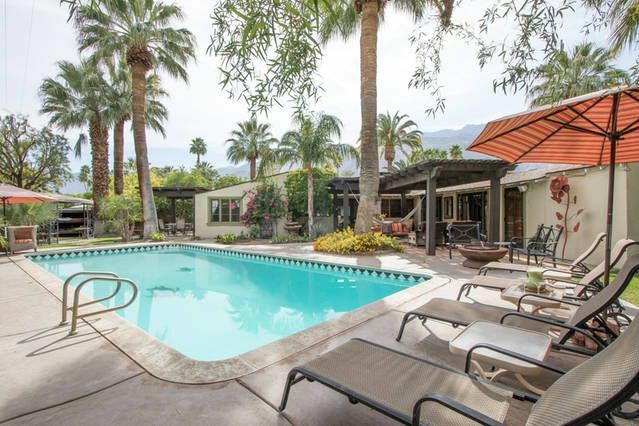 We chose the location because we love the history of the neighborhood, the proximity to Ruth Hardy Park for tennis, it is very quiet neighborhood with many interesting homes, and it is very close to downtown Palm Springs. Downtown Palm Springs offers world-class restaurants and shopping. The property is on a corner lot that is completely private. We restored the original pool which is huge, 16' x 36'. The mountain views are priceless, and the property is 1/3 of an acre with many fruit trees such as grapefruit, orange, tangerine, pomegranate, and fig. I wanted the home to be a fun place to stay, so it is decorated with all unique, yet comfortable furniture that suits the style of the home. I have also found many interesting pieces of artwork to enjoy throughout the home. Most of our guests at this point are repeat guests, many of them have been coming back since the first year we started renting the home. I came here with my two kiddos to get away for a few days over spring break. Sadly my hubby was not able to join us...but VillaHermosa was a wonderful rental choice. I absolutely love the outdoor/ indoor living. The weather was wonderful and the kids LOVED the pool! The villa was so clean and spacious--giving us all just enough privacy but still being together. :) I will definitely come back and share this property with my husband. Thank you so much Angie for sharing your beautiful home. This home is very private, has a great hot tub and pool (altho you will need to pay extra to heat the pool). The home has a wonderful feel to it with lots of character. It is comfortable and has great nooks and crannies to relax. It has an old school feel to it, just a wonderful air of relaxation. It is not terribly updated, but the feel of the place way overrides other places having foo foo, stale accommodation. We will be back. It is super close to town and the airport. We will definitely be back next time we are in Palm Springs. Highly recommend this place. Relaxing hideaway with so much character! This was a lovely home! The privacy is amazing; the neighborhood is quiet. The home is spacious and the back yard is huge and amazing. We enjoyed sitting by the pool and swimming/using the jacuzzi. Our dog enjoyed exploring. The neighborhood is very walkable, and close to downtown. Angie was a pleasure to work with, as well. Highly recommend this property! We experienced record rainfall but still had a great time on Valentines Day. The property owner was easy to work with and was always available. We will stay here again. The house was clean and had everything we needed. We enjoyed the pool, hot tub and the beautiful yard. We had a baby and a small child and were happy with the small bed for one of them. Wonderful location, security, and amenities. We especially enjoyed the gorgeous saltwater pool.